What is Acute Sinew Liniment? 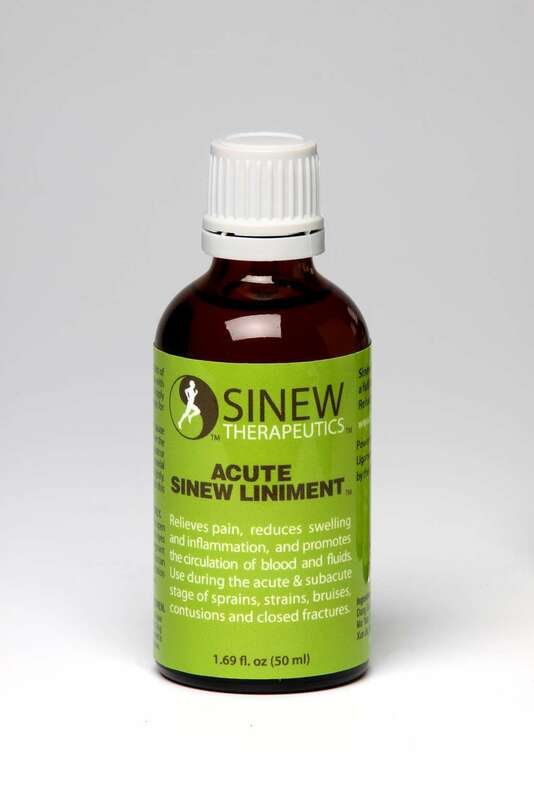 Acute Sinew Liniment is a safe and effective topical herbal remedy specially formulated for use during the acute and post-acute stage of sprains, strains, bruises, contusions and closed fractures. The acute stage refers to pain, inflammation, swelling, spasms, redness and bruising in the injured area. The post-acute stage refers to the swelling and inflammation gradually decreasing, but pain, limited range of motion, and weakness are still present. 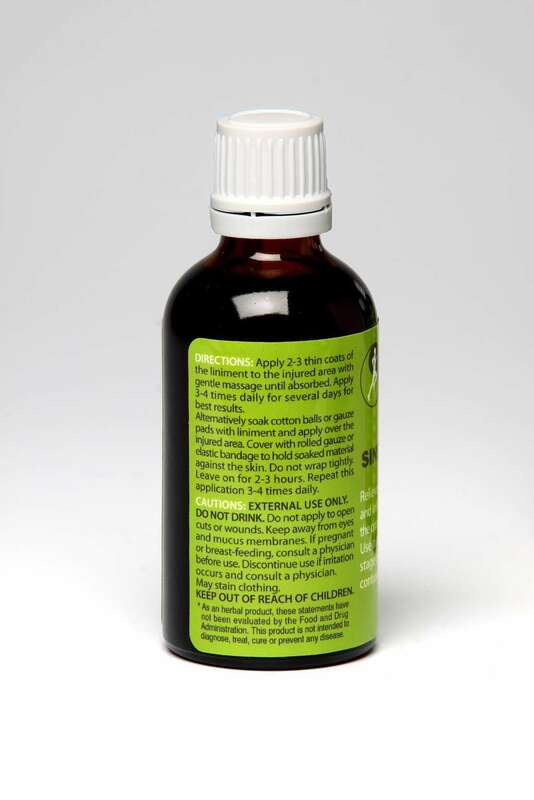 Acute Sinew Liniment contains a balanced mix of cooling and warming herbs that do not overheat an inflamed area. The cooling herbs reduce inflammation and swelling as effectively as ice, while the warming herbs kill pain, promote circulation, and break up stagnant blood and fluids that are blocking circulation to the damaged tissues. * Reduces swelling and inflammation. * Disperses accumulations of stagnant blood and fluids. * Increases blood flow to injured tendons, ligaments, cartilage and muscles. * Gets circulation moving in the injured area so that cells have a fresh and larger blood supply to repair damaged tissues. 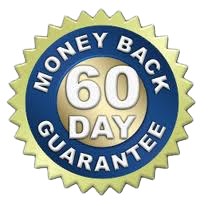 * Helps rebuild healthy tissues to heal and prevent scar tissue from developing. How do I use Acute Sinew Liniment? Apply 2-3 thin coats of the liniment to the injured area with gentle massage until absorbed. Apply 3-4 times daily for several days for best results. Instructions are on the label. For external use only. Sinew Herbal Ice can be used in-between applications. 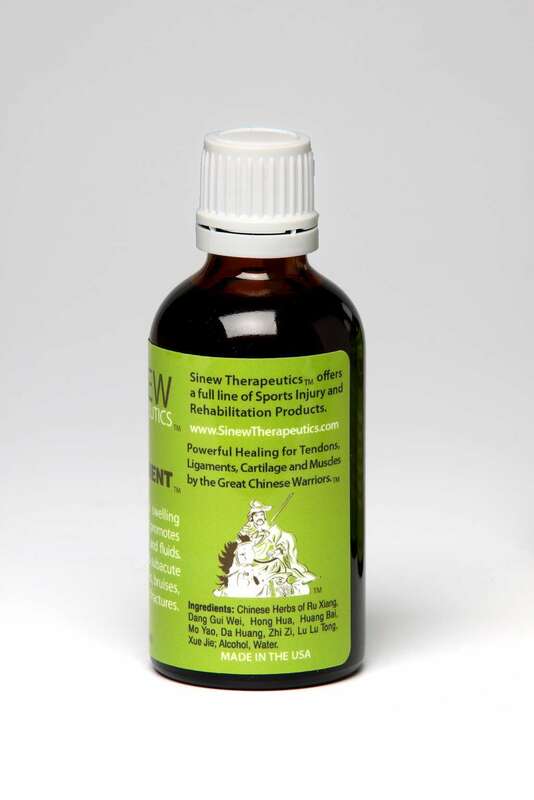 Acute Sinew Liniment contains the following laboratory-tested Chinese herbs in therapeutic dosage: Da huang, Zhi zi, Hong hua, Huang bai, Mo yao, Ru xiang, Xue jie, Lu lu tong, Dang gui wei; alcohol, water. How is Acute Sinew Liniment different from other pain relieving products on the market? In conventional medicine, many pain relieving products are aimed at just treating the symptoms, such as by providing an analgesic effect on the injured area to reduce the sensation of pain, thereby masking the pain. Acute Sinew Liniment contains Chinese herbs that kill pain, but painkilling herbs are not mere analgesics that mask pain.